Presently, the direct application of non-uniform synthetic seals mostly relies on injection moulding processes. Injection moulding of thermoplastics (PVC, TPE, etc.) or RIM – Reaction Injection Moulding – with polyurethane are the most commonly used processes. Thanks to the patented WST and WSTplus technologies, Exypnos can offer two more cost-effective alternative methods of applying polyurethane seals to the most diverse products, in both large and small volume runs. WST is the basic technology, in which the polyurethane frame is moulded onto the product in an open mould. It is a pressure-free pouring process, facilitating the use of a flexible mould. This flexible mould or ‘Soft Tool’ makes it possible to apply a closely fitting seal also to products with larger dimentional tolerances. The precise movement of the dosing head and potentially also the mould ensures that the polyurethane is poured into the desired shape. However, the fully open mould does restrict the design options of the polyurethane seal. This is offset though by the limited cost of the mould and the extreme flexibility in terms of product dimensions. The WST patent has been held by BASF since 2009, but interested parties can obtain a free license providing they use BASF PUR material. To meet the demand for more design options involving WST, Exypnos has enhanced the existing WST technology into WSTplus. Using an additional flexible profile, the ‘WSTplus Profile’, this technique is based on the use of a semi-enclosed cavity. It is temporarily opened using the spray nozzle and closes again once the polyurethane has been applied. This means that – even at the rear – smaller dimensional tolerances can be maintained and additional features, such as raised ridges and spacers, are moulded on the spot in polyurethane. 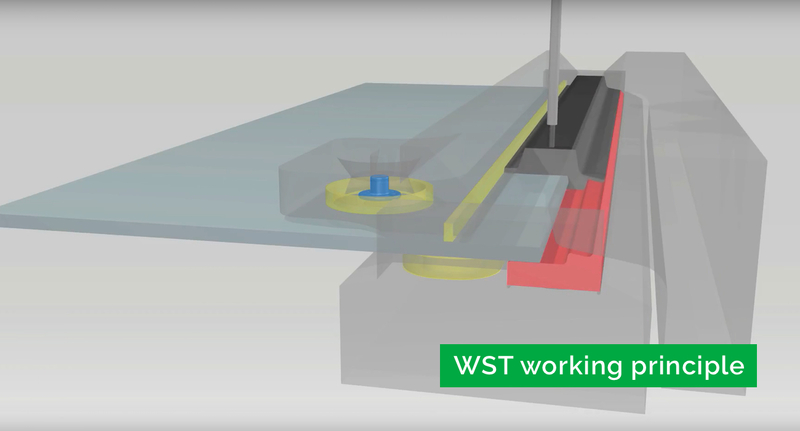 The WSTplus Profile is positioned and kept in place by the upper mould half, which can also position various integrated features with great accuracy where required. 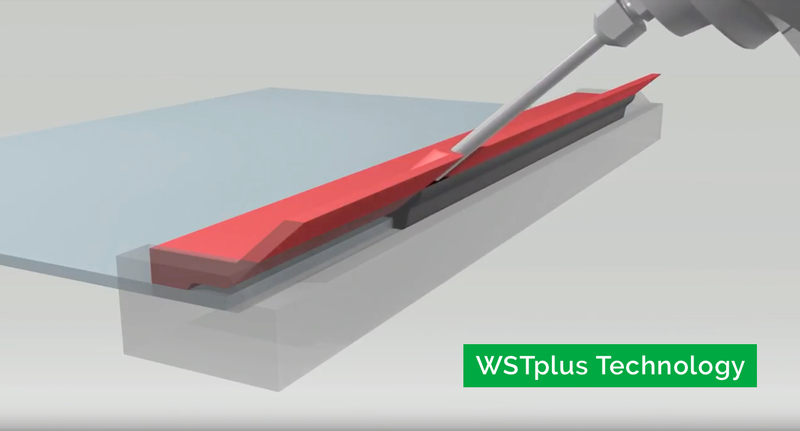 This makes WSTplus technology particularly suitable when the product is to be framed and various components glued to it during the same process, using the same polyurethane material. 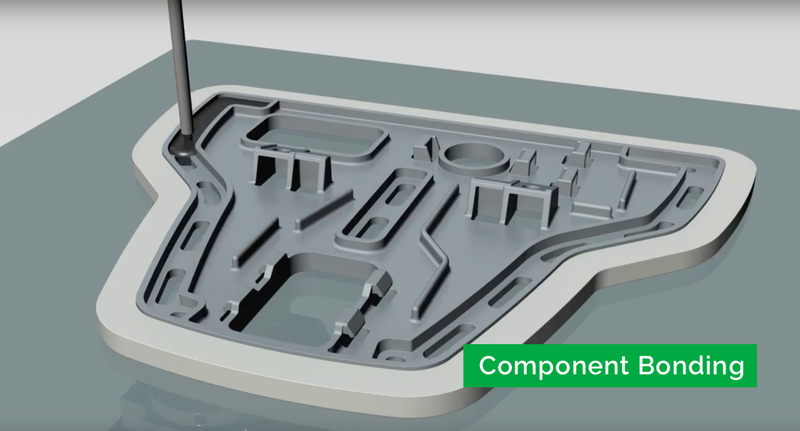 Exypnos presents its patented Component Bonding Technology, an innovative method to connect components to substrates. This technology prepositions and seals the component on the substrate in a manner, that when the reacting polyurethane mixture is poured through dedicated openings in the component, a shape is obtained that anchors the component. Component Bonding Technology eliminates surface treatments and results in limitless material selection towards adhesion. Pressure-less pouring facilitates precise positioning of components, while short curing times are obtained by the fast reacting polyurethane glue.